You deal with it every few weeks. A client loses a parent, sibling, child, or spouse and they (or you!) are left to deal with the myriad of financial and personal issues in tying up the estate. Major items such as bank and brokerage accounts, real estate holdings, and partnership agreements have most likely been planned for well in advance. It’s the lower value assets that often present the largest headache. For example, how should you handle the sale of a vehicle for your client? At CarLotz, the consignment store for cars, we hear about this challenge from trust and estate professionals all the time. How do you maximize the sales proceeds from a vehicle for your client while minimizing the hassles given the countless number of details associated with settling an estate? Below we explore the options. 1) Sell it to a used car dealer. 4) Consign it for sale. The first three options each have their own benefits and drawbacks, so in selecting one of these methods, you are choosing some sort of trade-off between value and convenience. The fourth option, vehicle consignment, represents a growing trend in the used car market because it allows sellers to maximize both value and convenience with no trade-offs. Let’s dig a bit deeper into these options. Dealerships buy low and sell high. They make money on the spread between their purchase price and the ultimate sales price they receive from the end consumer. A used car salesman’s job is to make as much money as possible on each car, so the price they offer consumers for trade-ins is typically very low. The benefit here to you, however, is convenience. Most dealers will write you a check for the car on the spot – it’s just not a price your client may like. Selling privately offers much higher proceeds than selling to a dealer, but you have to get the car cleaned, photographed, listed, and then deal with strangers in marketing and negotiations. Buyers who require financing or need to trade-in a vehicle are likely not able to buy this car from you, so your universe of buyers is limited. On the plus side, however, you are likely to make thousands of dollars more for your client, which will set you apart in the eyes of your client. You just have to be willing to invest the time and experience the hassle of the private market. There are several services that will pick up your vehicle, take it to auction, and give your client a tax credit for the ultimate auction price. The process is fairly easy, and the price is typically $500 to $1,000 greater than what a dealer would give you. Vehicles sold through auction to charity generate a price, however, that is meaningfully lower than the private market value. If a charitable donation is your client’s wish, maximizing the sales proceeds through the private market and directing those to the charity of choice may be the better option. Vehicle consignment allows you to realize the full market value for the vehicle while outsourcing the work required in selling the vehicle to a consignment store. 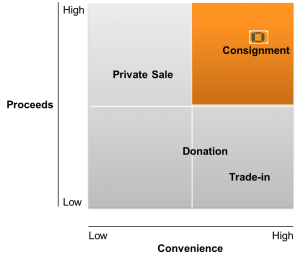 The proceeds generated through a consignment sale are thousands more than the wholesale / trade-in price from a dealer even after the consignment fee. Additionally, reputable vehicle consignment stores accept trade-ins, offer financing and warranty options to buyers, and generally make the buying process easy so that the car being sold can generate the most proceeds in the shortest possible time. As a trust and estate professional, your job can be stressful. You have a lot on your plate, and you are constantly searching for ways to maximize the value of your clients’ assets. If you need to manage the sale of a vehicle for a client, consignment will allow you to provide the most value without the hassles traditionally associated with selling a vehicle privately. For more information on vehicle consignment in your area, visit CarLotz.com or call (804) 399-0600.